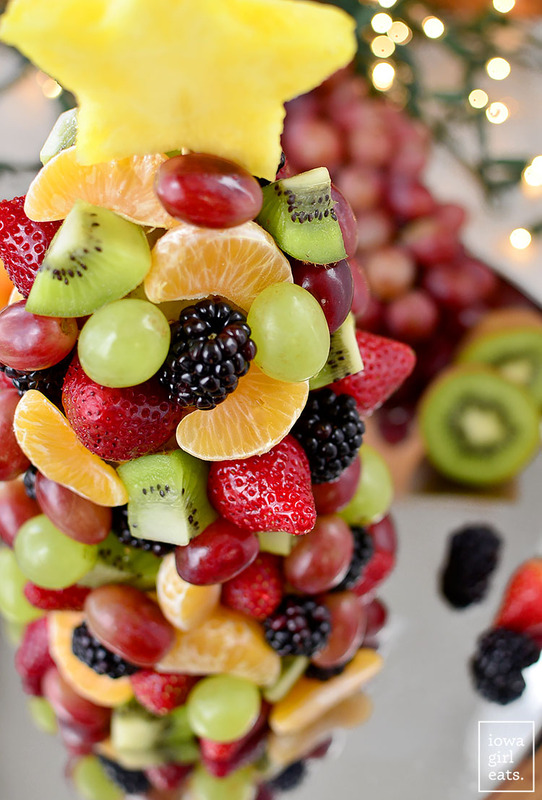 Start a new holiday tradition with a beautiful and fresh Fruit Christmas Tree! 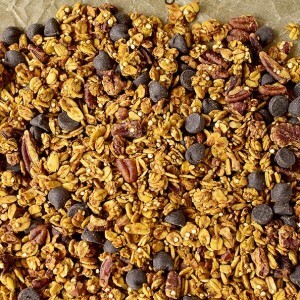 Perfect for parties, a dessert table centerpiece, or a healthy treat for Santa. Happy Monday, everyone, did you have a good weekend? Who’s ready for the countdown to Christmas?! I was going to make a paper chain with Lincoln a couple weeks ago but forgot and didn’t think four loops would drape anywhere beautifully. That is to say, I’m not super on top of my Christmas traditions at the moment, but may have started a new one that’s so fun and festive it won’t matter that “Penny” formerly known as “Patch” aka Lincoln’s Elf on the Shelf has been perched in the same spot on the mantle since last Thursday, nor that Mama forgot to pre-purchase tickets for the sold out Santa Express train experience this weekend and we had to settle for riding cramped trains with metal cages at the mall instead. Who needs clever elves and hot cocoa on an actual train when there’s Fruit Christmas Trees to build and eat?! Let’s address the elephant in the room real quick. I didn’t make any Christmas cookies this year. I’ve axed what little refined sugar remained in my life after completing Jacqueline Smith’s Go Sugar Free course a few years ago – notably the 2pm Sierra Mist I just couldn’t quit. PRAISE THE LORD and thank you Perrier, you fizzy angel, you! 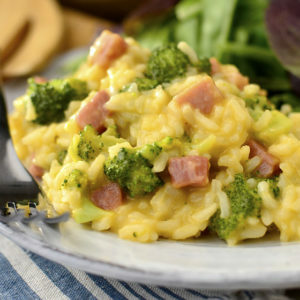 – over the past couple of months due to health reasons and it felt disingenuous to promote a recipe I wouldn’t eat in “real life”. But who said Christmas cookies get to have all the holiday fun? Last week I created this 100% edible and refined sugar-free Christmas tree made of fruit and I. Am. Flipping. OUT. over how adorable it turned out! My enthusiasm was matched by Lincoln’s when he laid eyes on this beaut after naptime last week. He’s crazy into crafts these days but something told me a nearly 2.5 year old + several dozen spiky toothpicks was a recipe for disaster, not a ridiculously awesome Fruit Christmas Tree, so I assembled while he slept then surprised him with it after venturing downstairs. While he missed out on putting the Fruit Christmas Tree together, he was more than happy to eat it up. This kid loves fresh fruit, which is one sweet treat I have zero problems with him eating to his heart’s desire! 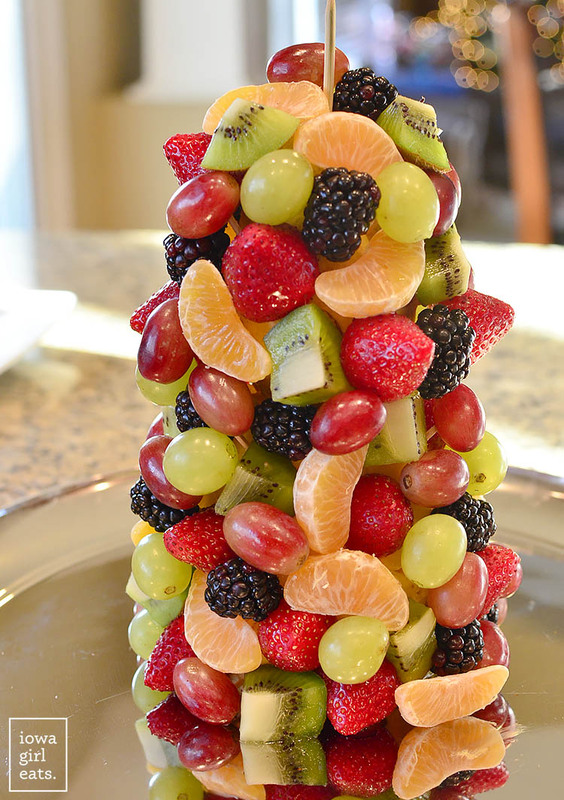 Seriously – if you are tapped out on sugar and Christmas cookies, enter these final few weeks of the holidays on a fresh and healthy note by building a Fruit Christmas Tree with your kids, friends, or yourself then serve during Christmas Eve cocktail hour, leave it out for Santa, or let it star as a healthy holiday dessert table centerpiece. Moms, if you’re searching for things your kids can do while on break from school over the next couple of weeks, say hello to at least an hours worth of activity between picking out, prepping, and popping fresh fruit onto toothpicks stuck in a fresh pineapple and pear base. 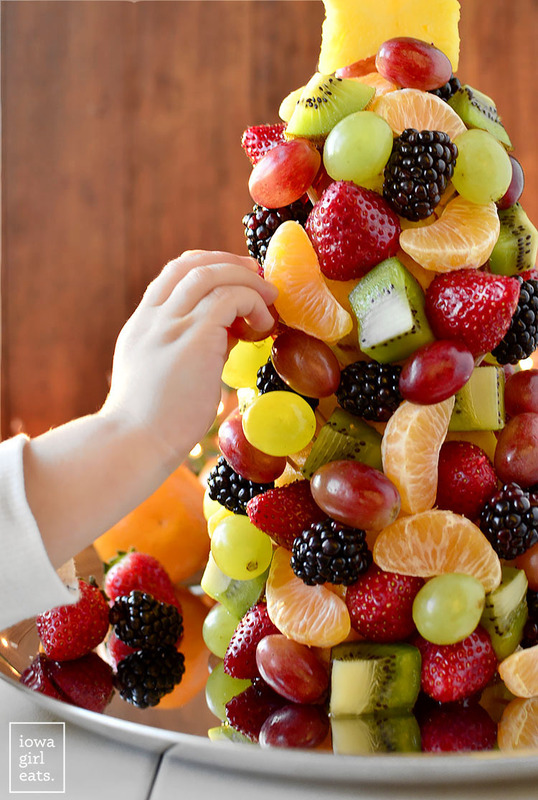 Of course it could go a lot quicker than that – I assembled my Fruit Christmas Tree from start to finish in about 30 minutes – but this project is one you can stretch out and feel great about letting little ones devour the finished product. While Lincoln didn’t get in on the assembly action this year, I have no doubt we will make this Fruit Christmas Tree together for many, many years to come as a tradition I can feel really good about. 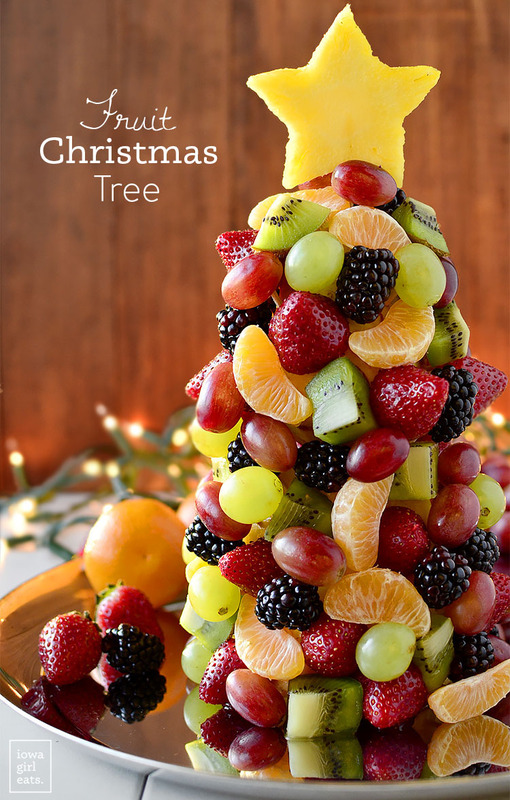 As far as this year, time’s a-tickin’ so snag some fresh fruit and get to work creating this fabulous fresh Fruit Christmas Tree! 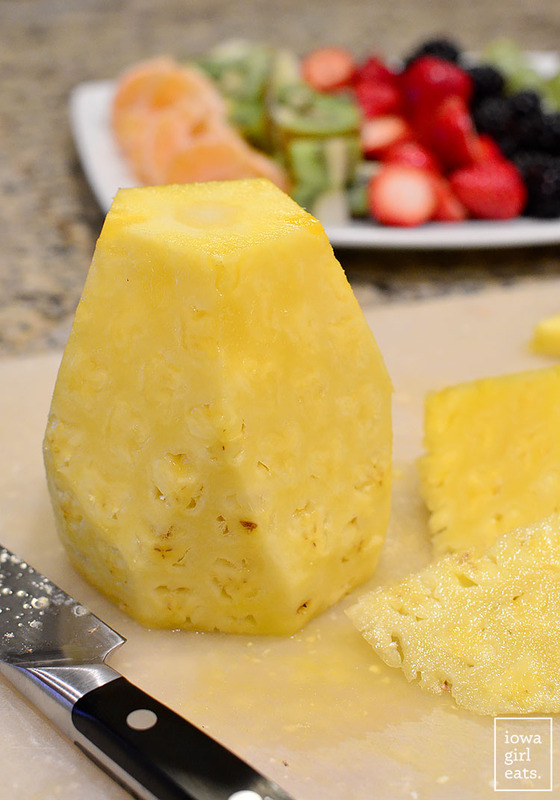 Start with a ripe pineapple. 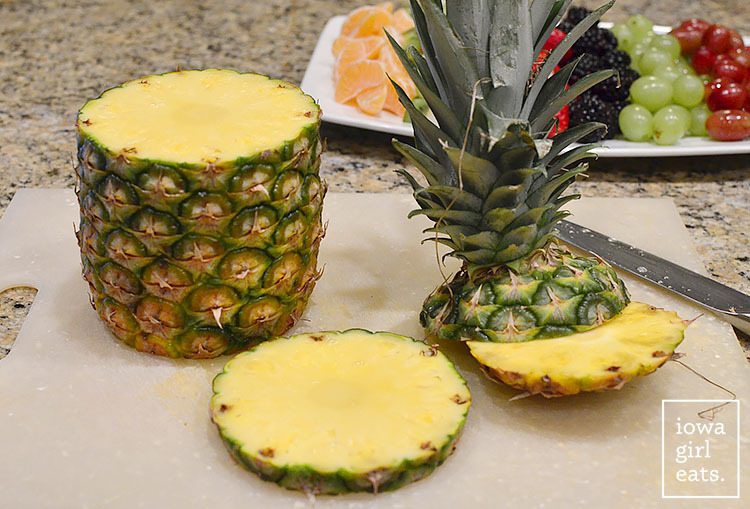 The best way to tell if a pineapple is ripe is to pull out one of the fronds on top – if you can pluck it out easily, it’s ripe! Slice the top and bottom off, then cut a small slice off the top. Insert a star cookie cutter into the thin slice, which will become the tree topper. If you don’t have a star cookie cutter – no problem, just use what you’ve got! Next take a bamboo skewer and push it through the center of the pineapple. 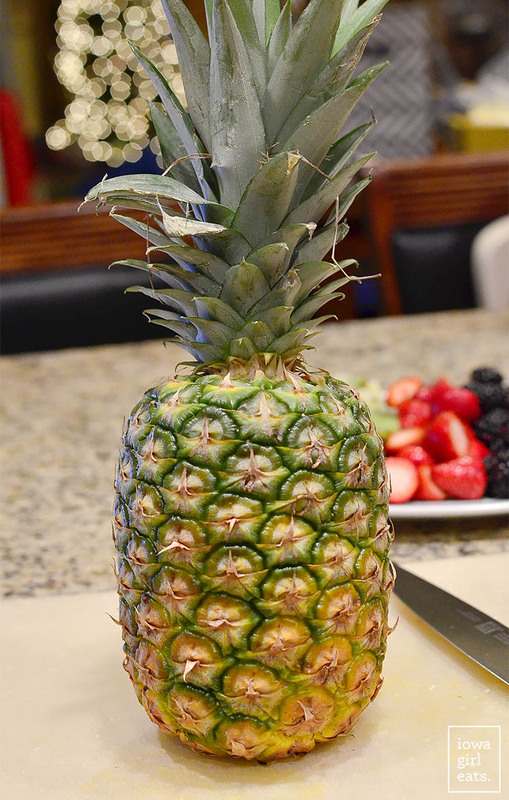 This is why having a ripe pineapple is important. If it’s underripe it’ll be hard to get the skewer pushed through the core. Next, spike a slightly underripe pear onto the skewer leaving the end uncovered – that’s what you’ll stick the star onto at the end! Tree trimming time! You could use whatever fruit you love or have on hand, but I used an assortment including clementines (always have these in the house around this time of year!) kiwis with the skin left on so they don’t slide off the tree, strawberries, blackberries, and red and green grapes. Raspberries, blueberries, or chopped cantaloupe would work great too! Start placing toothpicks into the “tree” at a slight angle then add the fruit, breaking the toothpicks if necessary. 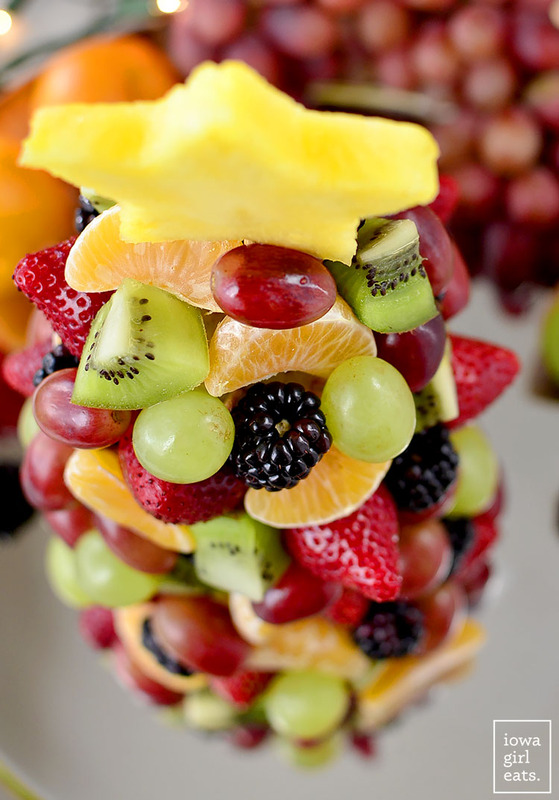 I found it best to place the bigger fruits first – strawberries, orange slices, kiwis, etc. – then fill in the gaps with small fruit like grapes and blackberries. Keep going until the tree is completely filled up – have FUN with it!! Stick the star topper on the skewer, then serve. Talk about merry and bright! Place pineapple onto a serving tray then insert toothpicks around pineapple and pear at a slight angle, breaking a little off if necessary, then add fruit. I found it easier to place most of the bigger fruit first then fill in with the smaller fruit like grapes. 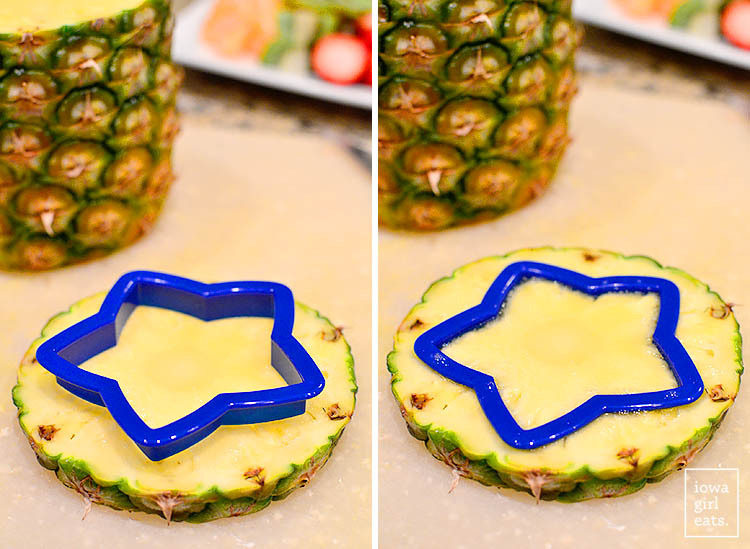 Add the pineapple star to the top of the skewer then serve. 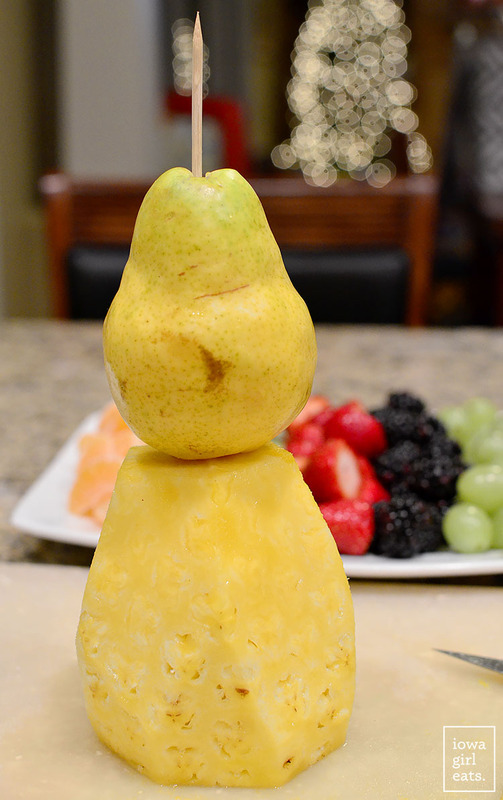 You can make the Fruit Christmas Tree several hours ahead of time but keep covered with Glad Press 'n' Seal or Saran Wrap and refrigerate until ready to serve. 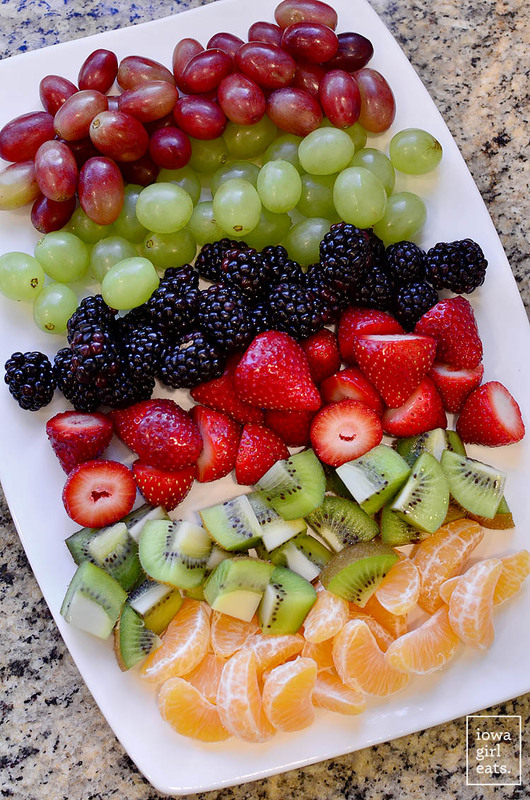 Use whatever fruit you like - blueberries and/or raspberries would also be fine to use! Inspired by Live. Learn. Love. Eat. Big or little, young (just maybe not too young!) 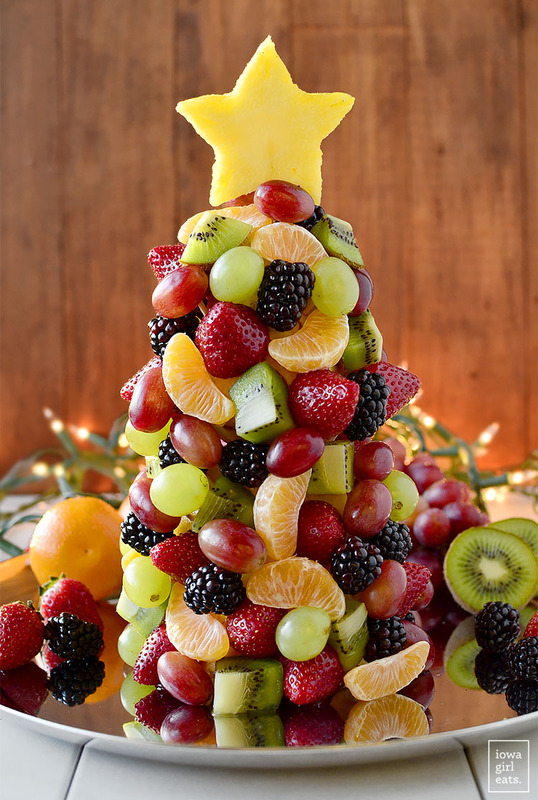 or old, this edible Fruit Christmas Tree is going to knock everyone’s socks off. Healthy and so, so beautiful. Hope you start a new tradition this year – enjoy! I’m so dying over how adorable this is! 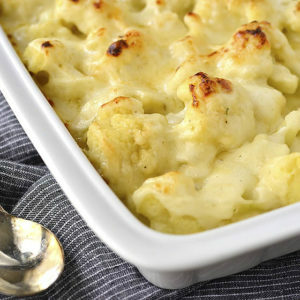 This looks like a much tastier (homemade!) version of an Edible Arrangement – what an awesome idea! Love this! Such a great idea, thank you! Yum!! 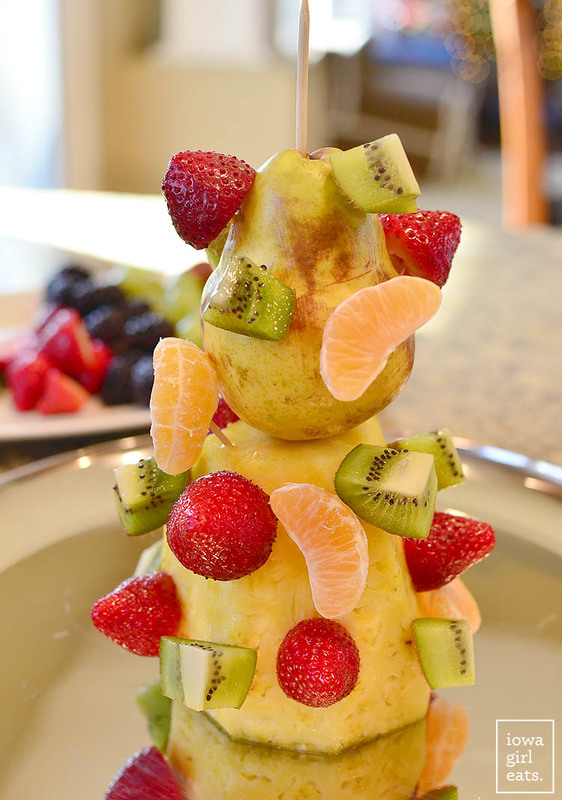 Your fruit Christmas tree is too cute! Such a great idea for a beautiful centerpiece at a Christmas party! Happy holiday to you!!! This is so pretty! I love it! I have to remember it for company potluck next year. Xoxo hope u r feeling better! That is adorable! I was planning on making a fruit platter but this is way more fun. We did the Santa Express ride this year and it was fun. I can’t decide which is more fun, going at night with the kiddos in their jammies or during the day so you can see where you are going on the train. Either way, the kids love it! I saw you as I was leaving Scenic Route yesterday but didn’t want to interrupt your conversation!! Hope you guys have a merry Christmas too! This is basically amazing! I LOVE how cute it is! This is so cool! I fear if I tried to make it though it would fall down all over the place. Haha! What an adorable idea! Sill partial to those Christmas cookies, but this is a welcome addition to the mix. So creative!! Love this idea! Wow, this is so beautiful, and creative! I really like this, and your work is excellent. I am amazed at how pretty this looks! I hope you still let him have some cookies! 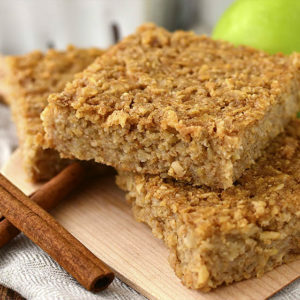 Just cause you can’t don’t forget that kids still love their special treats! I made this with my daughters to serve at Christmas brunch. 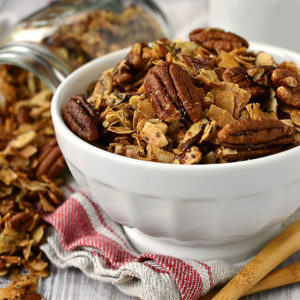 It was so easy, we had fun making it, and it was a HUGE hit! I think I’ll be making it again for other holiday events. We made this last year for Christmas morning and it was a hit! I can’t believe I made this and it looks similar to your picture! Thanks for the fantastic idea! 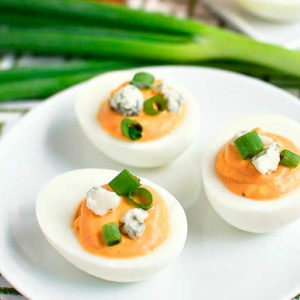 I’m planning to make this for a holiday gathering this weekend – any suggestions on how to transport it?? I don’t want the cuteness to get smashed! Good question! On a platter for sure then maybe attach the star to the skewer once you get there? That way you can stabilize the tree by holding the skewer as you transport!